"Perfect for autumn, these moist and fluffy cupcakes are a must for any holiday gathering." Beat the pumpkin puree, white sugar, brown sugar, shortening, butter, milk, vegetable oil, and eggs together in a large bowl until smooth. Whisk the cake flour, dry buttermilk powder, cornstarch, pumpkin pie spice, baking powder, baking soda, and salt together in another bowl. Add the dry ingredients to the pumpkin mixture, stirring until mixed. Pour batter into the prepared muffin cups, filling each cup about 2/3 full. Bake in the preheated until the center of the cupcakes spring back when touched, about 30 minutes. Cool in the pans for 10 minutes before removing to cool completely on a wire rack. 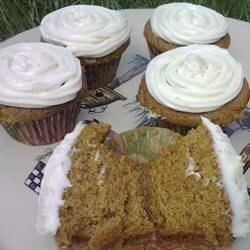 These cupcakes are rich with pumpkin and spices and are moist and delicious. If you do not have pumpkin pie spice, you can alternatively use: 1 teaspoon ground cinnamon; 1/4 teaspoon ground ginger; 1/4 teaspoon ground allspice; 1/4 teaspoon ground cloves; 1/4 teaspoon ground nutmeg. My daughter and I made these. Everyone loved them.